The definition of a step and repeat banner is a procedure for placing the same image on plates in multiple places. Simply, it is a backdrop/wall display that has sponsor, company and sport team logos on its purpose of advertising and capturing photos of celebrities or famous individuals during red carpet events, media press conferences and many more special events. However, these are NOT only limited to celebrities. The step and repeat backdrop banner provides opportunites for everyone to stand on red carpet and to capture photos with each individual's special events emphasized. We, Sign11.com, are known for our professional and friendly customer service. 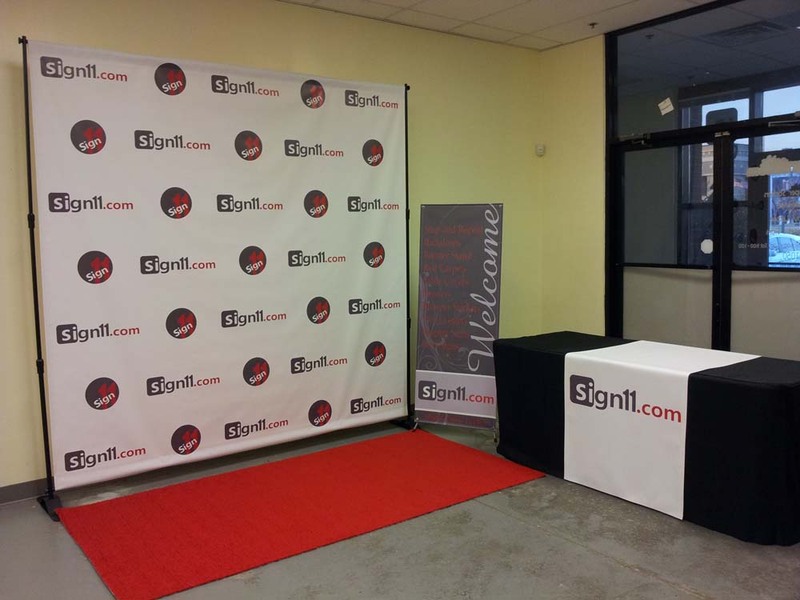 We provide quality step and repeat banners to all customers nationwide. We make step and repeat banners in all sizes ranging from as small as 4'w x 8'h up to 150'w x 8'h. Not only do we provide quality custom banners, we provide a combo package with stand and red carpets to make your red carpet events even more special and stand out! We NEVER outsource our works and all works are done in house which enables us to have the fastest turnaround in the industry. We are very flexible and we welcome unqiue design requests as well. Feel free to give us a call to discuss your needs! Call Sign11.com NOW and plan your most exciting red carpet events!